Our new raw pine honey also comes from the same part of Greece as our raw fir tree honey. Our bee keeper Iordannis uses the same methods as he does when producing his fir tree honey. The area where the bees collect the honeydew is free from pesticides, chemicals and fertilizers. Instead he uses organic hops to reduce parasitic mite populations in his honey colonies. This makes the honey completely organic. Iordannis relocates his beehives, once they have completed collecting nectar from the fir trees, to a lower altitude to a forest of pine trees. 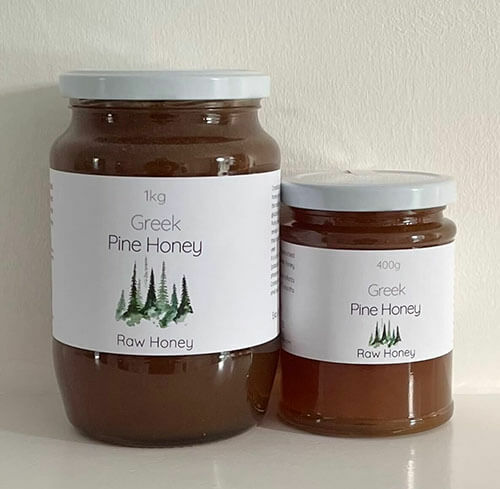 Pine tree honey accounts for almost 65% of the total honey production in Greece and is a type of forest honey made by bees collecting honeydew. It is a darker honey with a stronger taste, a higher mineral content and encompasses particular nutritional and therapeutic benefits. Studies indicate that honeydew honeys, such as pine honey, have stronger antioxidant properties compared to the more common floral honeys. Due to its anti-bacterial properties, it can also be applied directly to the skin to hasten the healing of wounds, burns, and sunburn. A recent study compared 18 honey varieties, both floral and forest honeys, and it found that Greek pine honey had the strongest anti-bacterial properties amongst all the tested honeys. (The Journal of Microbiology, Biotechnology and Food Sciences, 2012). It is a rare category of honey with a wonderful flavour and an aromatic fragrance; it has fewer calories than pollen honey and a unique taste that is not too sweet and loved by honey lovers. Pine honey crystallises slowly due to its low glucose levels and as such will remain fluid for more than 18 months.